Whether we like it or not, the Fourth Industrial Revolution is upon us. A new World Economic Forum report details the implications of technology on the future of work and humanity's place in it. 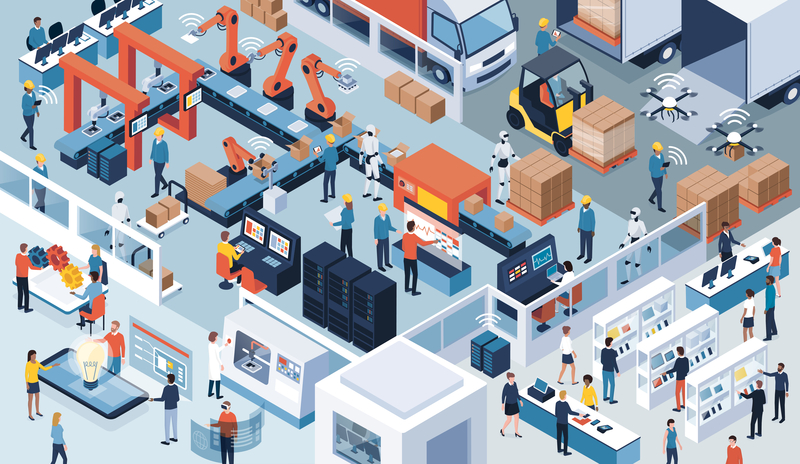 A more optimistic picture of the future of work was the message in the World Economic Forum’s report on the impact of new technologies on jobs by 2022. Their prediction? There will be more jobs created than destroyed by automation and artificial intelligence, at least in the short term. 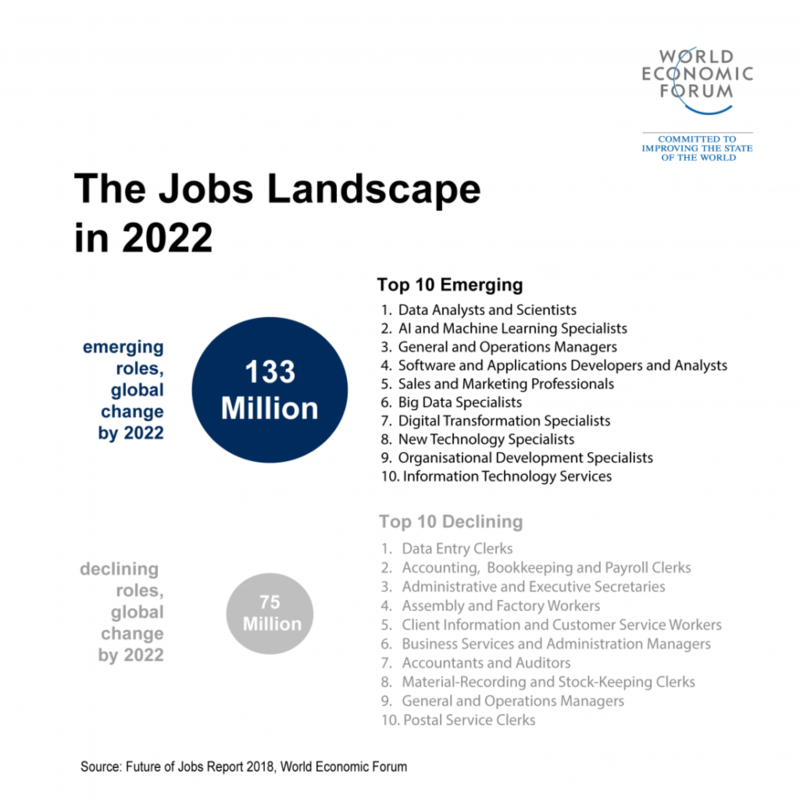 There is hope that humans will adjust to the loss of 75 million jobs in the global labor market over the next four years by reskilling for emerging job categories. That is if policymakers and employers grasp the opportunities in investing in human capital instead of treating it like a liability says the WEF. 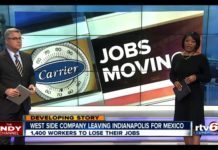 If they do, then 133 million new jobs will offset the losses, a net gain of 58 million jobs. 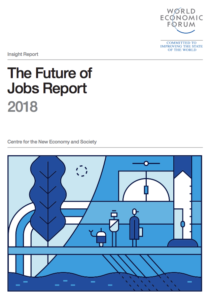 In the Future of Jobs 2018 report, the WEF surveyed representatives from 313 companies representing 15 million workers across 20 countries. Their collective response to the accelerating pace of technology is that it’s good for business and therefore a driver of future growth. It is uncertain whether it will be good for the workers of the world as low-skilled labor becomes increasingly automated and AI and algorithms replace rote digital tasks. “These transformations, if managed wisely, could lead to a new age of good work, good jobs and improved quality of life for all, but if managed poorly, pose the risk of widening skills gaps, greater inequality, and broader polarization. 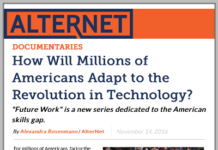 In many ways, the time to shape the future of work is now,” the report says. 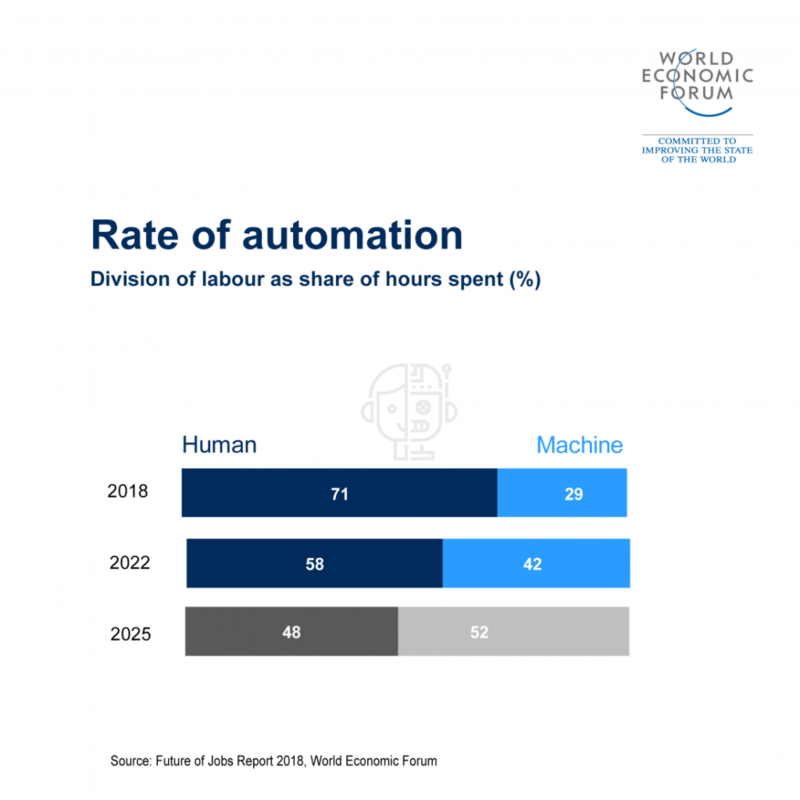 By 2025, the WEF expects machines to take up 52 percent of total work hours and finally eclipse human work. It is an optimistic view of technology that automation will free humans to do higher-level tasks and leave the grunt work to algorithms and robots. In previous industrial revolutions, this has borne out, especially when considering the amount of food that is harvested for the world’s burgeoning population. Fewer farmers are needed and yet production can feed the majority of the world. But knowledge and education will divide the winners and losers in the Fourth Industrial Revolution, according to the WEF. It will be up to companies to encourage a culture of active learning over a lifetime, create effective reskilling programs and improve collaboration between stakeholders to commit to retraining their workforces. In other words, those who learn and use the technologies — and teach others how to use them — will be future-proof. The technologies driving labor changes are artificial intelligence, big data analysis, robotics and high-speed mobile internet represent the large-scale job growth opportunities. They also are the source of the specialized and highly-paid jobs that employers demand, such as data analysts, software and application developers, and E-commerce specialists. According to the survey, 85 percent of companies reported they are likely to adopt big data analytics technology. This was followed by app- or web-enabled marketplace and Internet of Things (IoT) technologies at 75 percent each. Emerging roles in tech will take up 27 percent of the labor market by 2022, an increase of 11 percent. Redundant roles will be eliminated in the meantime, falling 11 percent to 21 percent. At least half of the surveyed companies expect some reduction of their workforce due to automation. The most vulnerable workers are data entry clerks, accountants, administrative and executive secretaries and factory workers. We’ve seen the effects of automation on manufacturing which contributed to structural unemployment in this sector. What is more startling is the types of jobs that are threatened that require higher-level computer skills like data entry and accounting. These tasks will be augmented or even entirely supplanted by artificial intelligence. For companies to effectively utilize these technologies, they need workers with the skills and certifications to perform them. Since the majority of jobs in the future will require some sort of post-secondary education, getting people trained for these highly-specialized roles will be the challenge moving forward. WorkingNation’s Ramona Schindelheim interviewed WEF’s Saadia Zahidi last April and got her insight on how companies can collaborate to create training opportunities. 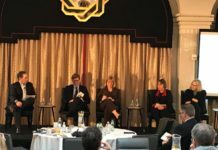 “There is a lot the private sector can begin doing by itself, for example by coming together as a sector or across industry lines, and by working with stakeholders such as community colleges,” Zahidi said. However, technical skills won’t be enough to keep workers ahead of technology. The WEF says that human-centric skills such as problem-solving, critical thinking and empathy. Those who can bridge the divide between technology and humans will be essential to shaping the future workforce. Child care, elder care, and workforce training will require multiple skill sets that cannot be mastered by technology. Technology will augment these tasks, but emotional intelligence and empathy will give humans an edge over machines for the time being. The WEF says that its projections are to be taken with a measure of caution as the rate of adoption of technologies can vary between countries and societies. Their survey measures the attitudes and beliefs of how companies see the future and their place in it. 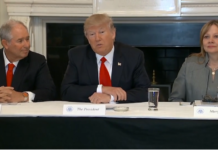 Right now they need workers to have the digital skills to gain a competitive advantage and it is apparent they are more willing to cut labor costs through automation. Managing this transition, the WEF says, will be the most important challenge of our current age. Expect a net growth in jobs despite increased automation: WEF from CNBC. To read the full report from the WEF: click here. Join the Conversation: Are we ready for the Fourth Industrial Revolution? Tell us what you think of the WEF report on our Facebook page.